Simone Biles, competing for the first time since dazzling at the 2016 Olympics, won all-around gold at the US Classic last month. For the first time in a decade, Boston will play host to the US Gymnastics Championships. This time, both women and men will compete at TD Garden in the national championships. The event will be a glimpse at the talent pool that will be competing for limited spots on the national team ahead of the 2018 World Championships, where the top three teams will secure a spot at the 2020 Tokyo Summer Olympics. When: Thursday, Aug. 16, to Sunday, Aug. 19. TD Garden is set to host the national championships this week as the sport and its athletes are still reeling from a sexual abuse scandal. TV: NBCSN, NBC, Olympic Channel. Competition format: Preliminaries will be held the first two days. The finals will be held the last two days. Autograph info: The daily autograph schedule can be found here. Four-time Olympic gold medalist Simone Biles is scheduled for an autograph session Thursday from 6:30-7:30 p.m. in the concourse. Two-time Olympian and four-time all-around US champion Sam Mikulak is scheduled to sign autographs on Friday from 6:30-7:30 p.m.
Miscellany: There will be a fan selfie station and merchandise stands in the concourse . . . Agganis Arena hosted the 2008 US women’s championships, but this will be the first time the city has hosted the national championships for women’s and men’s gymnastics. Last time out: Marked her return to competitive gymnastics by winning gold in all-around, beam, and floor at the US Classic in late July. Briefly: As a four-time Olympic gold medalist, Biles has the most extensive résumé of any gymnast competing at these US championships. 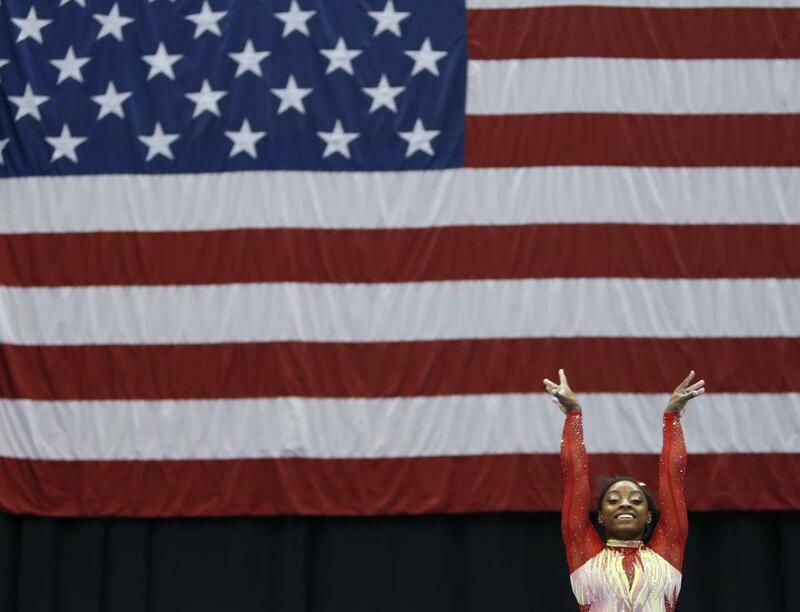 Biles is a four-time US all-around champion and three-time world all-around champion. Last time out: Earned bronze at the US Classic in July behind Biles and Riley McCusker. Briefly: Hurd, the reigning all-around world champion known for her ability to perform with her glasses on, is finishing up her first year at senior status. She took home all-around gold at the America Cup in March, and won silver in all-around at the Pacific Rim Championships in April. Last time out: Placed first in the vault, second in the floor exercise, and 10th in all-around at the US Classic. Briefly: Carey is the reigning US vault champion. At Worlds last year, she won silver in vault and floor exercise. Leanne Wong took home three gold medals in junior competition at the US Classic last month. Age: 14. Events: All-around (junior). Last time out: Won gold in all-around, vault, and floor at the US Classic in July. Briefly: Wong came away with four medals from the Junior Pan American Championships in June: All-around bronze and silver in vault, bars, and beam. Last time out: Repeated as all-around champion at the American Cup in March. Briefly: The Oklahoma Sooner is the reigning US men’s all-around and floor exercise champion. Earlier this year in NCAA competition, he won individual national titles for all-around, floor, vault, parallel bars, and helped Oklahoma win the team national championship. Moldauer won bronze in the floor exercise at the 2017 World Championships. Last time out: Won gold for all-around and still rings at the Pacific Rim Championships in April. Briefly: Before an Achilles’ injury derailed him in the last year, Mikulak had a streak of four consecutive US all-around titles. The Newport Coast, Calif., native and two-time Olympian was able to rebound at the Winter Cup Challenge earlier this year, earning gold in the all-around and floor. Last time out: Won gold in pommel horse at Pacific Rim Championships in April. Briefly: Kimble will head into the US Championships as the reigning champion in horizontal bar and still bars (tied with Michael Wilner). He was selected to compete on the team at the World Championships last year. Women’s juniors: Ciena Alipio (San Jose, Calif./West Valley Gymnastics); Claire Dean (Piedmont, Calif./Head Over Heels); Levi Jung-Ruivivar (Woodland Hills, Calif./Paramount Elite); Brenna Neault (Rancho Cucamonga, Calif./Precision); Ui Soma (Belmont, Calif./San Mateo); Leanne Wong (Overland Park, Kan./GAGE); Kayla Di Cello (Boyds, Md./Hill’s Gymnastics); Sydney Morris (Bowie, Md./First State); Sunisa Lee (St. Paul, Minn./Midwest Gymnastics Center); Tori Tatum (Chanhassen, Minn./Twin City Twisters); Aleah Finnegan (Lee’s Summit, Mo./GAGE); Alexis Jeffrey (Warrensburg, Mo./GAGE); JaFree Scott (Independence, Mo./GAGE); Jordan Bowers (Lincoln, Neb./Solid Rock); Kailin Chio (Henderson, Nev./Gymcats); Selena Harris (Henderson, Nev./Gymcats); Zoe Gravier, Holmdel, N.J./MG Elite); Olivia Greaves, Staten Island, N.Y./MG Elite); Lilly Lippeatt (Mason, Ohio/Cincinnati Gymnastics); Sydney Barros (Lewisville, Texas/Texas Dreams): Skye Blakely (Frisco, Texas/WOGA); Sophia Butler (Houston, Texas/Discover); Karis German (Spring, Texas/World Champions Centre); Katelyn Rosen (Boerne, Texas/Mavericks at Artemovs); Konnor McClain (Cross Lanes, W.Va./Revolution). Women’s seniors: Jade Carey, Phoenix, Ariz./Arizona Sunrays); Madelyn Williams (Vacaville, Calif./San Mateo); Alyona Shchennikova (Evergreen, Colo./5280); Morgan Hurd (Middletown, Del./First State); Adeline Kenlin (Iowa City, Iowa/IGN); Maddie Johnston (Boyds, Md./Hill’s Gymnastics); Grace McCallum (Isanti, Minn./Twin City Twisters); Kara Eaker (Grain Valley, Mo./GAGE); Maile O’Keefe (Las Vegas, Nev./Salcianu Elite); Olivia Dunne (Hillsdale, N.J./ENA Paramus); Margzetta Frazier (Sicklerville, N.J./UCLA); Riley McCusker (Brielle, N.J./MG Elite); Shania Adams (Plain City, Ohio/Buckeye Gymnastics); Shilese Jones (Westerville, Ohio/Future Gymnastics Academy); Trinity Thomas (York, Pa./Prestige); Simone Biles (Spring, Texas/World Champions Centre); Sloane Blakely (Frisco, Texas/WOGA); Luisa Blanco (Little Elm, Texas/WOGA); Audrey Davis (Frisco, Texas/WOGA); Jaylene Gilstrap (McKinney, Texas/Metroplex); Emma Malabuyo (Flower Mound, Texas/Texas Dreams); Ragan Smith (Lewisville, Texas/Texas Dreams); Deanne Soza (Coppell, Texas/Texas Dreams); Jordan Chiles (Vancouver, Wash./Naydenov). Men’s juniors: Brandon Briones (Gilbert, Ariz./Aspire Kids Sports Center); John Chou (Cypress, Texas/Cypress Academy of Gymnastics); Vitaliy Guimaraes (Arvada, Colo./University of Oklahoma); Riley Loos (El Dorado Hills, Calif./Technique Gymnastics); Justin Ah Chow (Miami /Universal Gymnastics); Lazarus Barnhill (Houston, Texas/Cypress Academy of Gymnastics); Garrett Braunton (Olympia, Wash./Cypress Academy of Gymnastics); Bennet Huang (Palo Alto, Calif./University of Iowa); Paul Juda (Deerfield, Ill./Buffalo Grove Gymnastics); Kevin Penev (Penfield, N.Y./University of Michigan); Colt Walker (Cedar Park, Texas/AcroTex Gymnastics); Dylan Young (Burbank, Calif./Wallers GymJam Academy). Men’s seniors: Yul Moldauer (Arvada, Colo./University of Oklahoma); Sam Mikulak (Newport Coast, Calif./US Olympic Training Center); Donnell Whittenburg (Baltimore, Md./US Olympic Training Center); Marvin Kimble (Milwaukee, Wis./Salto Gymnastics); Akash Modi (Morganville, N.J./Stanford University); Donothan Bailey (Mission Viejo, Calif./US Olympic Training Center); Allan Bower (Chandler, Ariz./University of Oklahoma); Sean Melton (Orlando, Fla./Ohio State University); Shane Wiskus (Spring Park, Minn./University of Minnesota); Alec Yoder (Indianapolis/Ohio State University). ■ Spectators can purchase all-session, multi-session, and single-session tickets online or by calling 800-745-3000 or at the TD Garden box office. ■ Items prohibited from TD Garden include: weapons, backpacks, alcoholic beverages, laptops, recording devices of any kind, drones, selfie sticks, laser pointers, artificial noisemakers, glow sticks, and Vape pens. ■ Parking will be available at the North Station Garage, located directly underneath TD Garden. ■ Sept. 6-10: Worlds Training Squad and Pan Am Squad Camp. ■ Sept. 10-17: Senior Pan Am Championships. ■ Oct. 10-13: World Selection Camp. ■ Oct. 25-Nov. 3: World Championships in Doha, Qatar. ■ Nov. 27-30: National Team Camp.